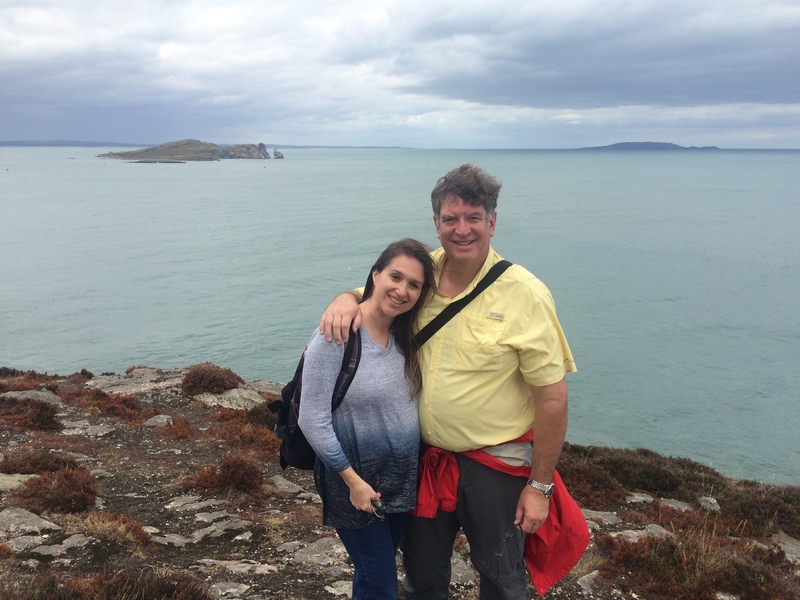 On a really neat hike around Howth, Ireland, guided by a really neat guy named Mark, I was introduced to the weird world of Irish politics two weeks ago. So two weeks later on Howth, I described this encounter to our guide Mark, himself of Belfast like the non-Irish Irishman in the girly pants, but Catholic, and he responded like a PhD historian. To wit: After 750 years of English occupation, colonization, violence, repression, uprisings, death, mayhem, chaos, cultural suppression, etc., the Irish are still sorting a few things out now that the English are mostly out. The idea that an Irishman from Belfast is not really an Irishman is to me, like, I don’t know, let me think of something incongruous, well, it is like finding out something so incredibly outlandish that your whole world view goes topsy turvy for a week. That was the effect. You would probably have to live there over a few lifetimes to figure it all out, because just as I was starting to comprehend the political and cultural dynamic of Northern Ireland, Mark then went on to describe Irish MP Danny Healy-Rae in the way someone from some deep urban ghetto cloister in New York City or Los Angeles would describe a rural NRA member farmer in flyover country. It was not pretty, but hey, who am I to judge, and I just sat and nodded along. Mark was an excellent guide and passionate about his homeland and his happy life there. I can relate, and so like I said, I just nodded along. Danny Healy-Rae is probably all alone in his singular rural style of political representation the world-over. Despite having a lot of rural areas and a lot of fired-up rural people, I do not think America has anyone like him in politics. Danny Healy-Rae is both principled and colorful, with a straight face. Yes, fairy forts. Wonder if you will, laugh if you must, but the man is indeed worried about how new roads will destroy or impact ancient fairy forts. Setting aside the rural traditions and folklore about fairies and fairy forts (and I do tend to side with both Native American Indians and Native Irish on their spiritual sensitivities to real things in the natural world that city folk aka Town Mice completely miss), fairy forts are real. A week after Mark had explained Irish politics so clearly to me, we visited Stonehenge. Have you gone there? Stonehenge is literally surrounded by fairy forts. Lots of hill forts and burial mounds and mystery places clearly built by the ancients for mysterious purposes that were really important to them and unattainable to us desensitized moderns. I was not expecting this side of Stonehenge, and it turns out it’s the presence of all those hill forts and mounds that make the big Stonehenge rocks so important. After seeing this unexpected oddity in person, I looked up “fairy forts” and read most carefully this one (of several) reference. Naturally the Irish ones came to mind first, because of the footage of Danny Boy talking about Fairy Forts in Ireland’s parliament. Archaeologically a “fairy fort” is a fascinating historic remain, and it’s evident why the ‘hick’ locals in all these places both revere and fear them. The English seemed to have plowed theirs extensively, which is very bad from the view of the historian, archaeologist, or Druid. Turns out that Danny Boy is not only concerned about new roads destroying Fairy Forts, but he is also publicly concerned about the explosion of rhododendron in rural Ireland. Now as much as Mark mocked Danny Boy’s unpersuaded opinions about man-made “climate change” (like Danny Boy, I too am unpersuaded by the heavily politicized, faked data behind the mere statistical models purported to be and shouted to be irrefutable “science”), Mark admitted he did not know the flora and fauna subjects along our beautiful walk on Howth. Nonetheless, he mocked Danny Boy over the rhododendron thing, too. That flora issue includes the tidal wave of invasive plants moving in on the beautiful Irish countryside. That would also include rhododendron, and you will not find a bigger faunal representation of imperial Victorian England (something Mark is very much opposed to) than the various copses of rhododendron planted and quickly spreading from one end of the Empire to the other. In other words, Danny Boy is objecting to invasive rhododendron for environmental and cultural reasons, things that his detractors say they care about, and his supposedly proud Irish compatriots are mocking him about it. They mock him simply because he comes across as a hick, not because they actually know better than he or care more for the environment than he. I think this hillbilly Irishman MP, Danny Healy-Rae, should get a lot more credit from his fellow countrymen than he has thus far received. At first I thought he was just an aggressive environmentalist trying to keep roads and invasive plants out of undeveloped Paradise. Now I think he’s also a keen historian! We will return to Ireland. Several other friends and friendly couple friends of ours were simultaneously touring Ireland when we were there, and between us all we all pretty much covered the whole country by car, bike, kayak, and foot. The collective photos we all took showed Ireland in all its splendor. What a beautiful, unspoiled, undeveloped, magical place is Ireland. Turns out that Ireland, the whole entire place, is one big beautiful, magical fairy fort! We are coming back, and we hope that Danny Boy has succeeded in diverting the roads, protecting the fairy forts, and uprooting the rhododendron. Mark, you will have to come with us, because I think you should see Ireland through our eyes. It might help you better appreciate the incredible natural beauty you have. And this next trip might help us all better figure out Irish politics, because as we can see with Danny Boy vs. the liberal Irish, Irish politics are a complete mess where up is down and left is right. When you have liberals advocating for environmental destruction and keeping the symbols of imperial England, and the conservatives opposing them are the greens, things are just not yet sorted out. That’s the best way to put Ireland. It just isn’t yet sorted out. But it is beautiful, thanks to the fairy forts.